Description: CSX C40-8W 7709 in the yard at Manchester, Ga. Description: CSX conductor gives a wave to railfans as Q652 passes thru Folkston. Description: Pounding hard up the West Slope of Sand Patch, Q35823 has an interesting array of motive power. Description: Since it seemed things werte going to quiet down a bit, I went back down to Cumberland and was able to nab this shot of the Q35823 again. Description: CSX 7709 sets at the point of a long train tucked away just inside the north end of the Amory Yard limits. A little more than a quarter mile north and this train will cross the Tombigbee River. Description: Caught it before it went into the shade! Description: The KCS Schneider Train comes through WR Tower with CSX Power. Today some friends and I went around the east side looking for trains. We did pretty good but could have done better, the weather didn't cooperate most of the day, but we had fun anyway. Title: A locomotive missing its number! Description: MISSING: Digits 7-7-0-9, Missing from CSX Locomotive 7709, if found, please contact your local police dept. Can anyone explain why 7709 is missing numbers on the cab? Description: Q125 heads South to melt the snow off of his cars. Description: Passing South Emerson after meeting Q142. Description: A combined SU99 and Q111 hurries westbound under Silver Grove Rd in Hardyston. Description: Going downgrade now the SU111 heads past Edison Rd in Ogdensburg. Description: SU111 charges westbound on the former L&HR and is about to pass ZINC. 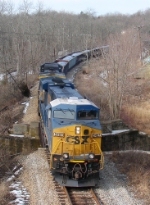 Description: CSX Q37713 heads through the S-curve.